In this blog post, I’ve reviewed 11 Free DNS hosting services for you. And discussed each free DNS hosting service provider one by one in detail. It’s appalling to hear that Distributed Denial-of-Service (DDoS) attacks are growing day by day! So, in order to protect your precious website from such vulnerabilities, a top-notch DNS hosting service is highly crucial. Luckily, these days, availing a reliable DNS service need not cost you even a penny thanks to the free DNS hosting services. 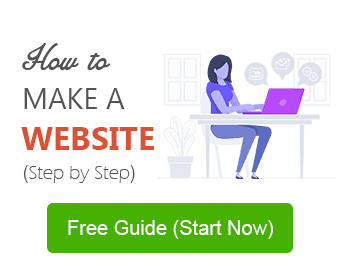 These free DNS hosting providers will allow you to setup your website with multiple DNS providers and safeguard it from being inaccessible to your users. But before we talk about that, let’s see what a DNS does. DNS is the acronym for Domain Name System. This is a system that maps domain names (or your website name or URL) into its respective IP address. The DNS utilizes DNS servers to do the mapping job for them. Put differently, the DNS servers maintain a list of website names (domain names) and map them to their corresponding IP addresses. Now let’s briefly check out the 11 free DNS hosting providers that we mentioned earlier. CloudFlare powers more than 38% of the managed DNS domains on the web. And it also possesses one of the world’s biggest authoritative DNS networks. Capable of delivering query results in few milliseconds, the company claims to be the fastest managed DNS provider now. They serve 86 billion queries in a day! Their servers can also make DNS updates live in just a few seconds! CloudFlare is also one of the biggest free DNS hosting services available now! Their free DNS service can offer much faster performance than its premium counterparts. However, being a managed DNS host, you may not have as much control as other free DNS hosting providers. But they provide added security to your website thanks to their intuitive blocking, filtering, and rate limiting features. If you are looking for a free Data-Driven DNS hosting service then don’t look beyond NS1. In terms of speed, they out-perform many of the top players in the industry. NS1 offers potent Filter Chain routing engine designed to easily manage highly critical and demanding applications on the web. This powerful routing engine can also help you customize your DNS. But most importantly, this routing mechanism takes smart routing choices in real-time to make your applications faster and reliable. NS1 also provides automatic traffic management by leveraging your infrastructure and real-time network data to ensure a high level of reliability and performance. If you want to tweak some code, no worries, their RESTful API is very user-friendly for programmers. Other major highlights of their free service are 500k queries per month, one Filter Chain, two free monitoring jobs, fifty records to name a few. Rackspace is free but only to its existing customers! Their current customers can avail their DNS hosting and management absolutely free of cost. Even though with just 5 or 6 POPs, they have an impressive track record of uptimes. Some of their main features include IP Anycast routing, automated migrations, flexible access, and load balancing. You can setup these features easily through their RESTful API and cloud control panel. They also have an easy-to-use interface. Rackspace allows you to have total control of your DNS. You can do a variety of tasks like adding, modifying, removing domains, records and so on thanks to their API and Cloud Control Panel. The free DNS hosting plan from ClouDNS is another free DNS service that you can try out with confidence. With servers spread out in North America, Australia, Asia, and Europe, CloudDNS employs a Round Robin (RR) architecture in their DNS network platform. With your free ClouDNS account, you can add three domains along with 4 DNS servers, 3 DNS zones, 3 Mail forwards, Dynamic DNS, support for native IPv6, round robin, and unlimited records or requests. However, they have reserved GeoDNS and DDoS protected DNS hosting to their premium members. Claiming 100% uptime, ClouDNS offers an easy-to-use interface for zone management and Dynamic DNS support. If you run into a problem, you can always get in touch with their support team via an online ticket system. Processing more than 7 Billion monthly DNS requests, FreeDNS network has been providing great quality free DNS hosting since 2004. They offer absolutely free DNS, Static DNS, as well as Dynamic DNS services. It may stun you beyond imagination but they really offer unlimited domains/account. With a long history of providing free DNS hosting services, FreeDNS is quick and easy to setup, exceptionally reliable, and fast. Most importantly, every update is made live on the internet – instantly! Obviously, the DNS hosting services provided by Hurricane Electric Internet Services is absolutely free. They have a solid network of DNS servers with more than 130 POPs (Point-Of-Presence) distributed across North America, Europe, and Asia. The company boasts more than 19000 BGP (Border Gateway Protocol) with more than 6000 varied networks. This signifies lower load time for your website and a greater experience for your users. With oodles of futuristic DNS resources at their disposal, this DNS hosting provider is definitely worth trying out. Handling up to 1 million monthly DNS requests, GeoScaling offers a bunch of unique features in its managed DNS services. They strive to give the best experience to your users by redirecting users by Country, uptime, AS number, custom rules, and server load. They have a low TTL (Time-To-Live), which means updated records are made live on the internet in less than 5 minutes. GeoScaling’s DNS service supports a variety of normal record types including the Service Record (SRV). And they also offer support for Dynamic DNS, and allows you to import, upload, and paste BIND zone files. If you happen to reside in France, Romania or Texas, you can avail their assured redundancy and scalability benefits. With an easy-to-use interface, you can add and update DNS records without reloading the web page. Any change is propagated to the nameservers instantaneously. You probably know Namecheap as a domain registration provider. But did you know that they also offer free DNS hosting services with Dynamic DNS? Namecheap has geographically dispersed name-servers that can boost your site’s performance and make it load faster. They also support almost every record type including SRV. They also have powerful and intuitive management console and offers 24/7 technical support to their customers. 1984 is definitely one of those free DNS hosting providers that you must give it a shot. Their service also supports almost all normal record types including SRV and TLSA. Other features included in their free DNS service are Web Redirects, Dynamic DNS, and Nameserver on Anycast network. In order to use 1984’s free DNS service, all you need to do is register a user on their home page. Their FreeDNS service offers total control over every domain you register with them. You can host your site anywhere and avail their DNS service for FREE! If you are looking only for a free secondary DNS service with an easy-to-use interface, then BuddyNS is just right for you! BuddyNS claims to be capable of updating your DNS data faster than any other DNS service providers. This speed is 10 to 100 times faster than the industry average! And it gives you up to 300k queries totally free per account! With 8 geographically distributed POPs, their service automatically syncs with the master DNS service in just a short period of 10 minutes. It can even sync it instantaneously using SyncNOW or NOTIFY feature. With a solid DNS infrastructure across the globe, BuddyNS can process your visitor queries much faster – irrespective of your visitors’ geographic location. BuddyNS has also maintained a 100% uptime since its beginning. And the best part is that they also allow you to integrate CPanel/WHM. With a secure and perpetually available network infrastructure, BuddyNS servers keep your domains ever accessible to users even your primary DNS goes down. Established in 1997, Dynu is a 100% free “dynamic” DNS service that you can sign up for! Their service is also free for a lifetime with a package that includes four domains, four subdomains, four MX records, four custom DNS records, four web redirects, along with other offline settings. Their service also supports virtually all types of records including A, AAAA, PTR, CNAME, TXT, SRV, SPF, and HINFO. With an easy-to-use control panel, Dynu’s DNS service offers total control of your domain name. You are also offered a free DNS client in this package. Dynu boasts a geographically dispersed network of DNS servers to ensure complete redundancy for your domain. The free package also offers several useful features including Port 80 redirection, offline options, Subdomains and MX records. The most crucial factor to consider while choosing one of these free DNS hosting services is the DNS lookup speed. Always opt for the one that has the least lookup speed. 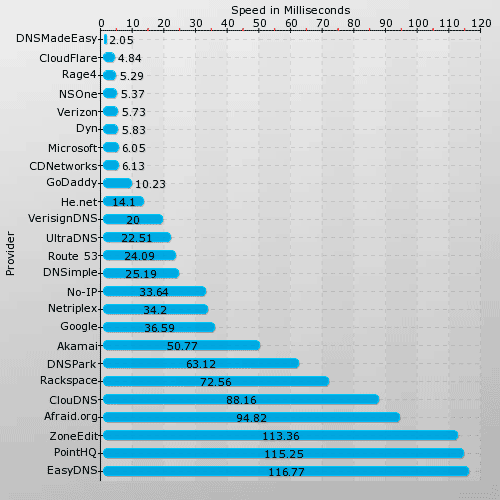 *Note – the list shown in the above figure shows DNS Speed Comparison of all Free and Paid DNS Hosting Services. If we do a comparative analysis of DNS lookup speed from the above list of free DNS hosting providers, CloudFlare tops the list – hands down – with just 4.84 ms (milliseconds)! That’s truly exceptional! The 2nd position is held by NS1. Yes, NS1 definitely has an exceptional speed of 5.37 ms but still a tad slower than CloudFlare. Rackspace, ClouDNS, and FreeDNS secure the next lower slots with 72.56 ms, 88.16, and 94.82 ms respectively, followed by the others. So my vote for the best free DNS hosting providers surely goes to CloudFlare! The availability of free DNS hosting services is truly a blessing to those online entrepreneurs on a shoestring budget. These free DNS hosting providers not only help save you on some serious bucks but also benefit from those premium features that a paid DNS hosting service plan would offer. But as mentioned earlier, do check for the DNS lookup speed before settling for one! What has been your experience from any of these free DNS hosting providers so far? It would be useful to add DNSSEC compatibility to the list. I know that cloudflare and Dynu support DNSSEC both of which I used before and they are equally good.